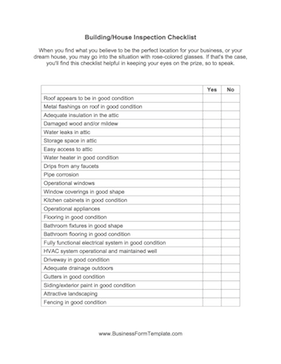 This Inspection Checklist Template has space to record the physical condition of a house or business, including appearances and functionality of systems. When you find what you believe to be the perfect location for your business, or your dream house, you may go into the situation with rose-colored glasses. If that's the case, you'll find this checklist helpful in keeping your eyes on the prize, so to speak.